CANTOR JESSICA FOX EPSTEIN, Temple B’nai Abraham’s Cantor since 2004, graduated from the School of Sacred Music of the Hebrew Union College–Jewish Institute of Religion (1998) after earning a Bachelor of Arts in English and a Bachelor of Music in Vocal Performance at the University of Illinois, Urbana-Champaign. A former officer and executive board member of the American Conference of Cantors, Cantor Epstein sings the music of Max Helfman on the Transcontinental Music CD, Kol Dodi: Jewish Wedding Music, and is featured on the CD, Shabbat Anthology, Volume II. 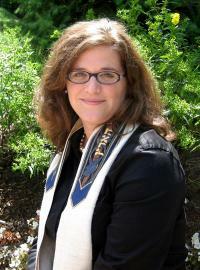 Her insights into parasha Tzav were published in Living Torah: Selections from Seven Years of Torat Chayim (URJ Press).